Send this impressive and caring expression of your deepest sympathy and and you'll make a difference in their day. 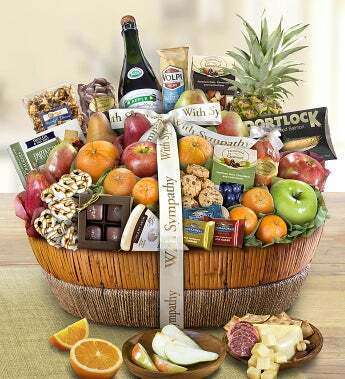 This handsome walnut stained willow basket is tied with a sympathy ribbon and filled with fresh fruit, nuts, snacks, chocolate and much more. Your thoughtfulness will be remembered.